20130927 - UP in the am and in to work but not to the desk. Straight to the shop floor and the system was down :-o well just receiving. So I was helping fold boxes and asking the ladies what they thought about blah blah that happens back at OOBA. They were like, 'What is OOBA?'. I could not believe that they had worked here for months and 30 yards away the Out Of Box Audit area is unknown to them. So I took them on a tour of the shop floor that their receiving feeds everyday. They LOVED IT. They asked questions and some of the things we saw and answers they got improved the process INSTANTLY!!! I would have loved to hang out on the floor all day, but I had meetings to get to :-( Into the big conference room for the first meeting and the only time I left that room all day was to go out to eat with Richard, Dave and John. After work I headed home and got the fam. We all headed to dinner at Panera. 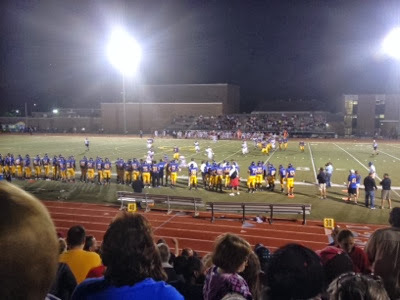 After dinner we walked across the road to the Gahanna high school football game. As soon as we got in the gate D vanished with his friends... J soon after and D talked the entire time. A person we know and some of his friends that built their own planes, flew their planes over the stadium during the Star Spangled Banner; pretty cool! We ran into lots of friends and it was great weather for football. We left at the end of the 3rd quarter with Gahanna up 40 something to 7. Home and boys to bed. I took pictures of stuff to post on ebay and then headed to the basement to watch more of the Zeitgeist documentaries and updated the blog instead.